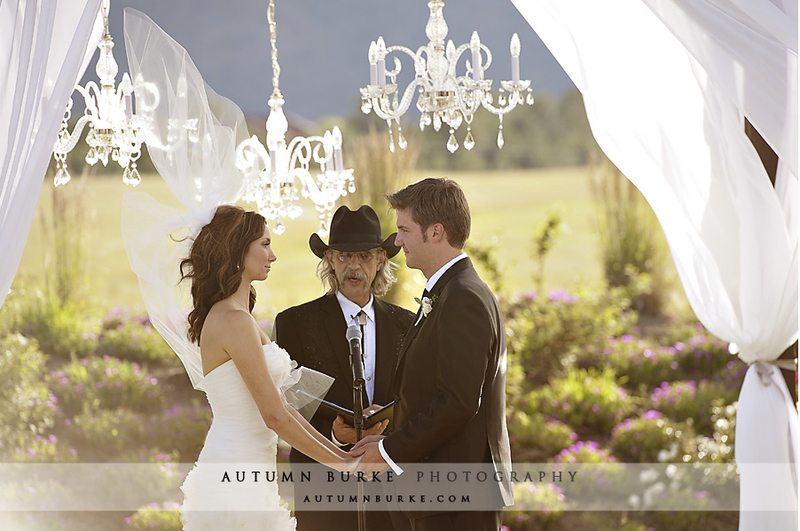 Using Chandeliers At Your Wedding Ceremony. You like the idea of the chandelier but you want a little bit of color. Why not add flowers? The example with the purple and pink flowers is so cute. You could use the flowers to match your color scheme. How and where to hang the chandelier is also important. You could create something specifically for it or you could use something natural to the surroundings like a tree. When it hangs from the branches, it almost looks like it becomes one with nature. The chandelier simply glistens in the sunlight and immediately transforms the decor and makes it elegant. It is amazing that one thing could have that effect on an occasion. All of the chandeliers are not the same either. Of course, you have the traditional one with multiple thin arms. But they come wider or more creative like the one that resembles a bird cage. If you can't decide where to have your wedding, try mixing the elements. You might be choosing one place but you would be able to have the best of both worlds.